The Bullet Train To Wealth Left When? There is a saying that I read in Rich Dad, Poor Dad that has stuck in my mind over the years: “The poor and the middle class work for money; the rich make money work for them.” And that is the secret that summarizes the very nature and end of investments. 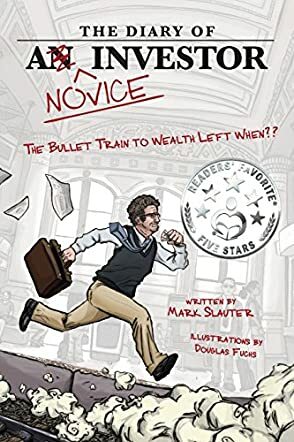 Fans of Robert Kiyosaki will be smitten by the powerful insights in The Diary of a Novice Investor: The Bullet Train to Wealth Left When? by Mark S Slauter. This is a book that explores the author’s own journey to investment, a book laced with practical advice and insight. Devoid of the kind of jargon a reader would find in books of this nature, this one tells a story and brings the reader face to face with real life situations, allowing them to form their own opinions and make their own judgments. You’re about to learn from the author’s first-hand experience in investment and to discover the kinds of decisions that affect what kinds of markets. I was hooked from the start by the beautiful prose and the author’s insightful writing. Listen to the opening lines: “Problems can be elusive creatures. Even though you may recognize a problem as it’s happening, its genesis and evolution become clearer when you stare backward through the looking glass of time.” Mark S Slauter has the uncanny gift of passing on lessons through the art of storytelling, leading readers through his personal experiences, his lessons in the family, and what it feels like to invest. The Diary of a Novice Investor: The Bullet Train to Wealth Left When? is a book that everyone interested in securing their future through investment should read. This book opened my eyes to serious facts and deep truths about the investing world, the markets, and how to make the best choices.